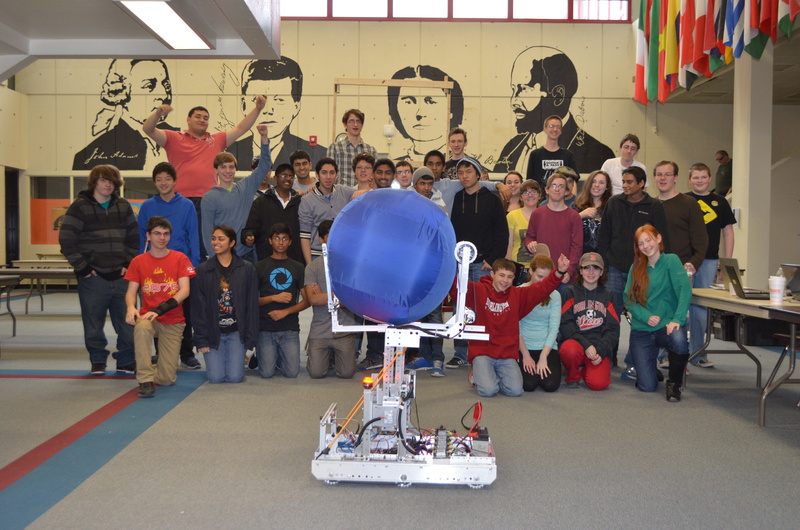 For several months the Burlington High Robotics Team has been hard at work after school, on weekends, and in their spare time perfecting their Devilbot for this past weekend’s FIRST Robotics Regional Tournament. The team did not disappoint; qualifying for the final elimination round competition after being selected by the Manchester club, “Robots by the C” to join their three-team alliance in the elimination rounds. The Devilbotz at BHS before their FIRST Robotics Competition at Northeastern. “During our first competition in Nashua we reached the quarterfinals, which was nice and we hoped here at Northeastern we could go even farther,” said team president Marko Lazarevic. The Devilbotz approach to this year’s challenge served them well all year long. With the “coop-ertition” offering scoring opportunities for goal scoring, defense, and cooperation between teams through passing and sharing, the Devilbotz focused on the later scoring from the get-go. “We wanted our robot to be maneuverable, fast, agile, able to get out of any rough situations, focusing only on the low goals,” said Lazarevic (the competition has goals both low to the ground and roughly six feet off the ground for balls to be both shuttled into or flung through from a distance.) The fork-lift style way in which the Devilbotz robot collected and maneuvered the ball also lent itself extremely well to cooperative play, making seemingly effortless passes that increased the value of goals scored. Over a day and a half the Devilbotz competed in 12 matches. 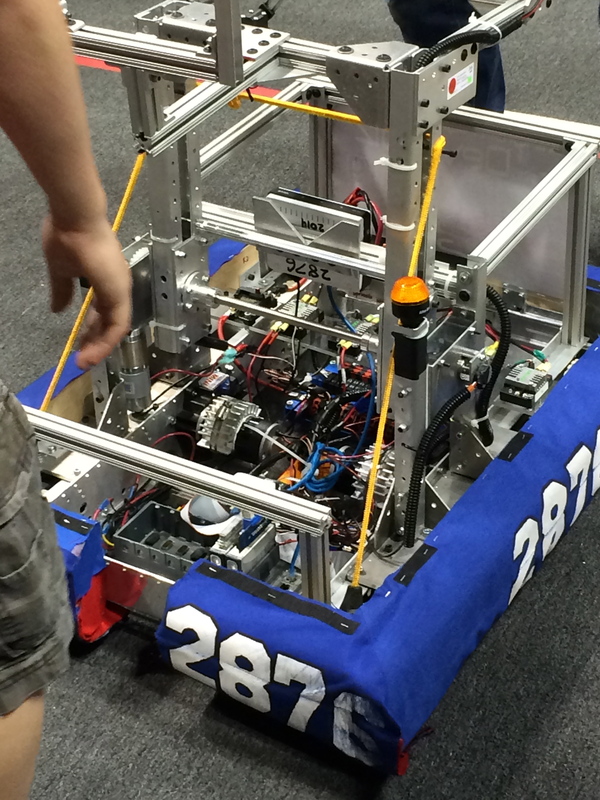 “Friday started off really well, we started out in the top 4 out of 40 robots which is really good,” said Lazarevic. “But then we ran into some trouble with a gearbox we were using.” That gearbox was more than just some trouble. After being rammed by a competitor robot mid-day Friday the robot faced challenges with its grabbing mechanism and had difficulty controlling and maneuvering the ball. Over the course of the day the Devilbotz slipped down the leaderboard and faced a great deal of uncertainty over how they would fare the next day. The Devilbot is a complex mesh of mechanical, electrical, and programming know how. With the robot back to full strength on Saturday the team allayed any fears fellow competitors had about choosing them for their elimination round alliance. Burlington joined Manchester and “Ozram” from Weare, New Hampshire during the draft stage between the qualification and elimination rounds. Devilbotz outside Granite State College during their first qualifying competiton earlier in March. The afternoon got off to a tough start, with another malfunction putting their newly formed alliance at a disadvantage and unable to catch up to their competition. With the robotics competition season coming to a close many team members now shift gears and focus their attention toward younger robot enthusiasts like the LEGO Robotics Club at Francis Wyman, sharing their expertise and mentoring abilities to help the next generation of club members hone their skills from an early age and prepare them for whatever challenge the FIRST competition throws at them.